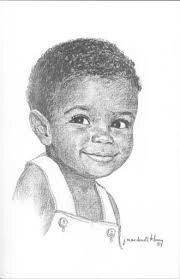 The library has 4 prints of children by artist J. Macdonald Henry titled: ‘Buttons’, ‘Top knot’, ‘Shine eye’ and ‘Cane row’. These are not the original charcoal drawings. J. MacDonald Henry was an internationally known artist born in Jamaica in 1960. Her mother and child portrait seemed to be the most popular of her works. She died more than a decade ago. 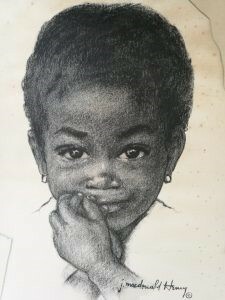 She was born in Kingston, Jamaica, and went to the United States on an art scholarship when she was 13 years old. She later graduated from the Carnegie Institute of Technology (now Carnegie Mellon University) with a B.A. degree in painting and design, followed by graduate work in ceramics at the University of Houston. She had her first one-woman show in Jamaica in 1960, and was commissioned to create artwork for organizations and businesses in Jamaica. 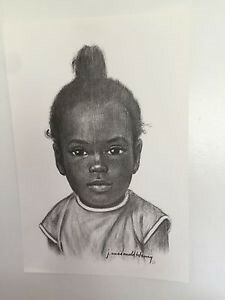 In 1961, she was involved in illustrating a series of Island Readers school books that featured Jamaican children. Linda Henry-Thomas, who identified herself as Henry’s daughter, said she passed away in September 2008. 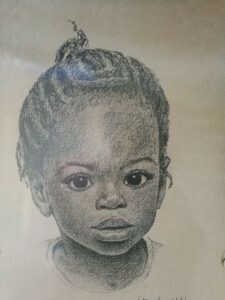 The drawings of the mother/child and children were described on several sites as the “Faces of Jamaica” series. We temporarily lost them during a move in 2010, but just found them back. So glad we did. So beautiful.